Between 1946 and 1964, the spike in birth rates in the US was so large compared to prior generations that the generation of children born were known as baby boomers. In subsequent generations, the higher number of babies born resulted in more goods consumed, more jobs created, more productivity generated, and more wealth created. The baby boomer generation has been associated with the good times: rock and roll music, economic prosperity, higher living standards, and longer lifespans. But in 2017, the first of the baby boomers were required by law to withdraw a minimum of 5% of their IRA and 401(k) retirement accounts. So, what will be the effect of these distributions on the stock market, your investment accounts and wealth? Is A Baby Boomers Pension Bomb Coming? Bonds Vs Equities: Which Should Baby Boomers Choose? What Can Baby Boomers Do? What Should Stock Market Investors Do? The post-war period from 1946 onwards was officially the beginning of the baby boom period, though records show that from 1943 to 1960 annual births increased to over 4,000,000. The cohort of leading edge baby boomers, born between 1946 and 1955, represents approximately 38,000,000 individuals. Trailing-edge baby boomers born between 1956 and 1964 represent 37,818,000 individuals according to the Center for Disease Control’s National Center for Health Statistics. Fast forward in time and what this means is that between 2017 and 2035, over 75,000,000 baby boomers are required by law to take IRA withdrawals once above the age of 70.5. According to IRA withdrawal rules, by age 70.5 baby boomers (and others) are obligated to start taking withdrawals if they have not already done so. Once above age 59.5, they are eligible to take withdrawals but above age 70.5 it is required by law. >> Related: Who Are The Best IRA Providers? Not all baby boomers have IRA and 401(k) accounts however – many government workers rely on state pensions, which are largely underfunded. 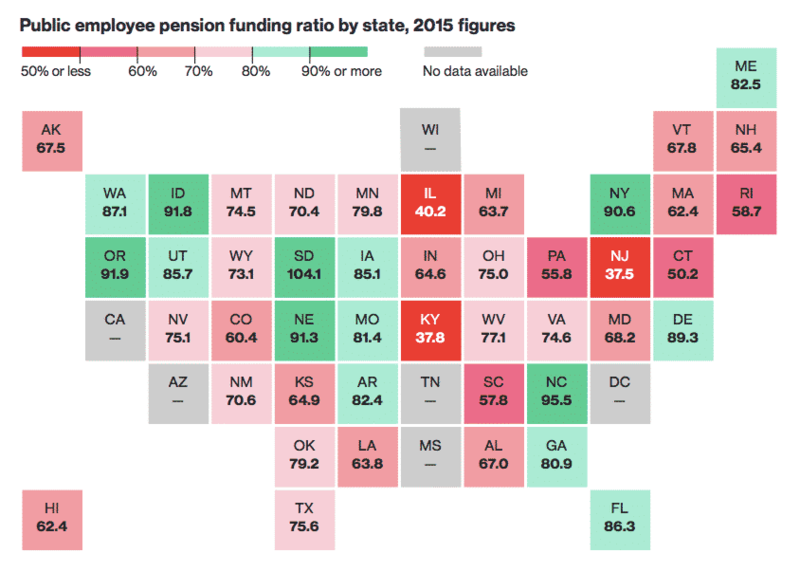 States like Illinois have massively underfunded pensions, but so too do many other states according to Bloomberg. As the largest generation in history to retire, baby boomers rely heavily on state and private pensions, and have large allocations to equities; up to 70% of boomers’ retirement portfolios are allocated to equities. At retirement, allocations to equities above 50% are generally considered aggressive, so baby boomers are, on average, taking on higher levels of risk at a time when erring on the side of caution is more prudent. And while history may not repeat itself, it often does rhyme. Over the last century, the end of each decade has been a perilous time in the stock market. Almost without exception, the end of each decade over the past century has been accompanied by a stock market crash. Which Should Baby Boomers Choose? 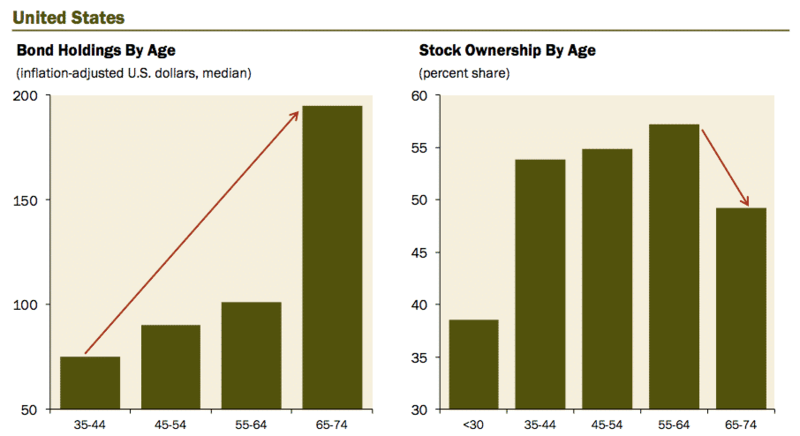 The largest asset allocation shift among investors takes place upon retirement. Generally, a big shift from equities to bonds takes place when retirees focus on portfolio income over portfolio growth. Low interest rates means that bond holdings don’t provide the income needed by baby boomers. So, baby boomers are caught between a rock and a hard place. Since 1980, the average drawdown in the stock market during recessionary periods has been 37%, so holding equities is risky. Yet the Federal Reserve has kept interest rates so low that bonds offer low yields that are insufficient to generate income to maintain boomers’ lifestyles. According to the U.S. government, the average American has $186,000 saved for retirement. Blackrock claims a lower number of $136,000. The average boomer has $1.1 million in retirement assets, which includes equity portfolios, homes and savings. But when you remove the top 1 percenters, the wealthiest Americans who skew the average number higher, the median boomer has approximately $200,000 in retirement assets. If you were to assume annual returns of 7%, which may be overly optimistic, that translates to gross income of $14,000 per year – a far leap from the $45,000 level enjoyed by the average boomer while working and needed to maintain a similar lifestyle. Without sufficient income, baby boomers may need to continue working and many will be forced to sell the assets they own, such as their homes, to raise the money needed to cover lifestyle expenses. Millennials may be required to renege on student loans to support boomer parents. But Millennials have their own financial heartaches to deal with. According to the Federal Reserve, 44.2 million Americans are saddled with student loan debt of $1.44 trillion. As an investor, look carefully at your allocation to equities, and your time horizon. As a Millennial, you have time on your side to ride out stock market storms. At the very least, look to companies like Blooom, which is designed to evaluate your 401(k) to make sure the asset allocation is optimized for your risk profile. Consider robo advisors, such as Betterment, which offer various features beyond investment management, including tax loss harvesting and retirement planners. As a baby boomer, you may not have the luxury of time on your side to ride out stock market undulations, so asking yourself how much you can afford to lose if a stock market crash were to occur is helpful to see if your allocations to equities need to change. If you have forecast a certain standard of living, take into account the required minimum distribution of 5% each year from your IRA or 401(k) and calculate what the average stock market drawdown during recessionary periods of 37% would mean for your portfolio and retirement. Keep in mind that when you take these distributions, they are taxed. While earnings growth over the years in your retirement portfolios was tax-deferred, withdrawals are subject to taxation. The key calculation to make is what your after-tax income will be. In some cases, it may make sense to retire early because it puts you in a lower tax bracket whereby you get to pay the government fewer taxes. The government doesn’t let retirees escape the required minimum distribution. To the contrary, they impose stiff penalties of 10% in addition to taxes on individuals who do not take distributions when required. In a nutshell, the government wants to get paid its tax revenues after allowing you to grow earnings tax-free for the years up to retirement, and if you try to avoid the obligation they take their share of your retirement pie and then some! Between 2017 and 2035, over 35 million baby boomers will be required to take the required minimum withdrawal of 5% from their IRA and 401(k) retirement accounts. With interest rates low, the median baby boomer has insufficient assets to live a similar lifestyle to the one they have enjoyed during their working years. Millennials have the luxury of time to ride out stock market fluctuations but baby boomers with less time to recover from stock market shocks should carefully evaluate their allocation to equities. Examine what tax bracket you will fall into when you start to take mandatory distributions, calculate your total income from retirement accounts and social security, and then project your annual expenses in retirement. You may decide it is better to retire early to avoid paying the government even more taxes that would put less money in your hands after you have paid your tax liabilities. What tips for a better retirement have you discovered? Share your retirement tips with us. We would love to hear from you. Soon a wave of Boomer retirees will be upon us. For them, time is of the essence to prepare for their nearing retirement. Use that time to gather all the options available that will help strengthen their future. In freemedsuppquotes.com/boomer-health-tips, it is highly suggested that Boomers should improve their health literacy. With more than 77 million people all across the country recorded to have poor health literacy skills (as documented by the National Assessment of Adult Literacy), the incapability to search, interpret, and use health information and resources can lead to financial, health, and even emotional problems. When addressing retirement health and wealth concerns, make sure to consider Medicare Supplement Plans and LTC Insurance. These two insurance solutions cater to boomer needs, efficiently allowing retirees to live life to the fullest during the twilight years. Thanks for the thoughts on boomers thinking about medicare supplement plans and LTC insurance, very valuable comments – greatly appreciated Leandro.